HACCP is a management system in which food safety is addressed through the analysis and control of biological, chemical, and physical hazards from raw material production, procurement, and handling, to manufacturing, distribution, and consumption of the finished product. You may also see real estate market analysis. HACCP involves looking closely at what you do in your business. It analyzes what could go wrong and what risks to food safety exists. It also includes identifying any critical control points the areas a business needs to focus on to ensure that those risks are removed or reduced to safe levels. You may also see functional behavioral analysis examples. HACCP will also help you decide what action you will need to take if something goes wrong, while also simultaneously making sure that your procedures are being followed and are working, which can be achieved by keeping records to show how the procedures are working. You may also see data analysis examples. 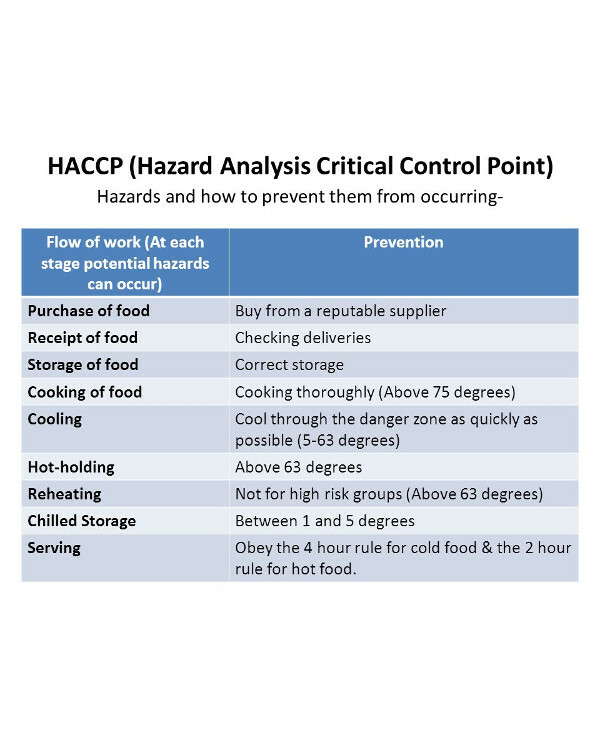 Hazard Analysis and Critical Control Points, or HACCP, is a systematic preventive approach to food safety from biological, chemical, and physical hazards in production processes that can cause the finished product to be unsafe, and designs measures to reduce these risks to a safe level. You may also see purpose and elements of a situation analysis. In this manner, HACCP attempts to avoid hazards rather than attempting to inspect finished products for the effects of those hazards. The HACCP system can be used at all stages of a food chain, from food production and preparation processes including packaging, distribution, etc. The Food and Drug Administration and the United States Department of Agriculture require mandatory HACCP programs for juice and meat as an effective approach to food safety and protecting public health. Meat HACCP systems are regulated by the USDA, while seafood and juice are regulated by the FDA. You may also see product analysis examples. All other food companies in the United States that are required to register with the FDA under the Public Health Security and Bioterrorism Preparedness and Response Act of 2002, as well as firms outside the US that export food to the US, are transitioning to mandatory hazard analysis and risk-based preventive controls plans. It is believed that HACCP stem from a production process monitoring used during World War II because traditional “end of the pipe” testing on artillery shell’s firing mechanisms could not be performed, and a large percentage of the artillery shells made at the time were either duds or misfiring. You may also see even cost analysis examples. 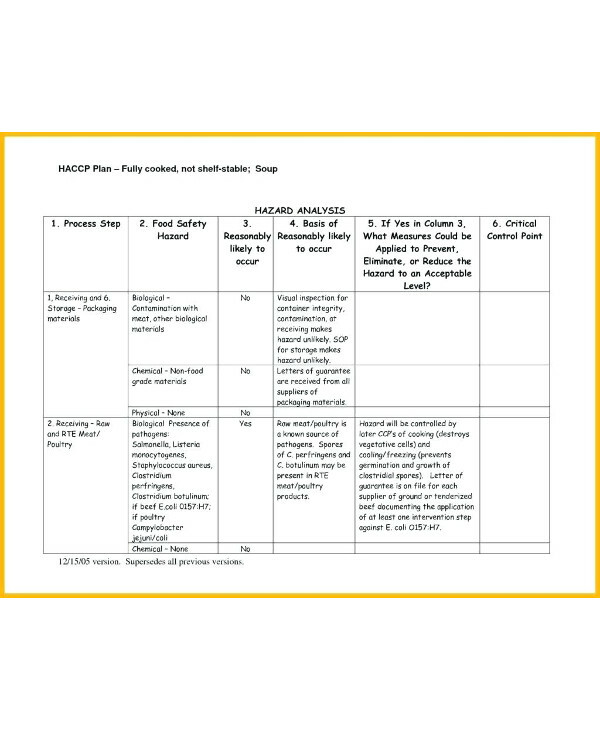 Based on risk-assessment, HACCP plans allow both industry and government to allocate their resources efficiently in establishing and auditing safe food production practices. In 1994, the organization of International HACCP Alliance was established initially for the US meat and poultry industries to assist them with implementing HACCP, and now its membership has been spread over the professional and industrial areas. You might also be interested in quantitative analysis. 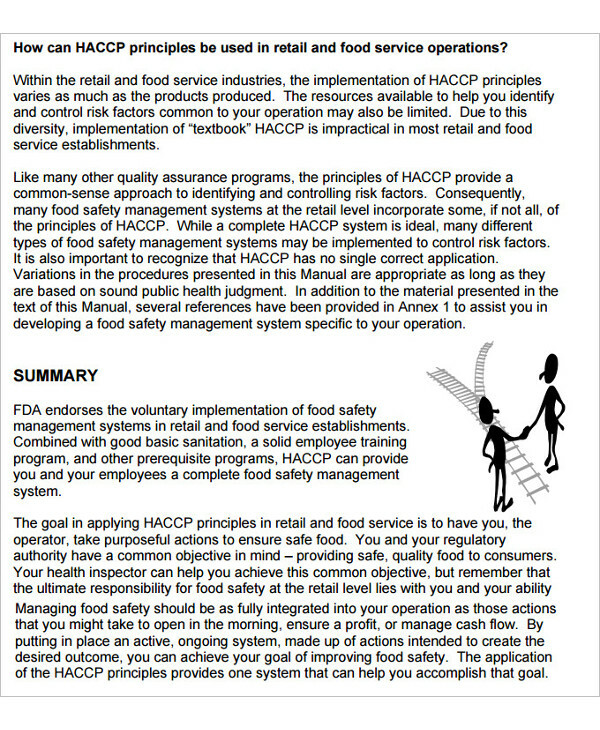 Since then, HACCP has been applied to many other industries other than food, such as in cosmetics and pharmaceuticals. This method, which in effect seeks to plan out unsafe practices based on science, differs from traditional “produce and sort” quality control methods that do nothing to prevent hazards from occurring and can only identify them at the end of the process. You may also see perform break even analysis. 1. 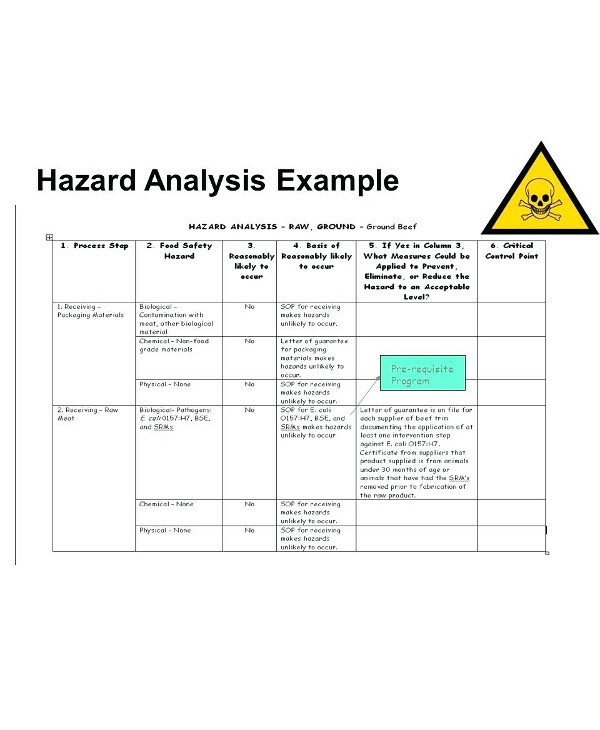 Conduct a hazard analysis. Plan to determine the food safety hazards and identify the preventive measures the plan can apply to control these hazards. A food safety hazard is any biological, chemical, or physical property that may cause a food to be unsafe for human consumption. You might also be interested in gap analysis. 2. Identify critical control points. A critical control point (CCP) is a point, step, or procedure in a food manufacturing process at which control can be applied and, as a result, a food safety hazard can be prevented, eliminated, or reduced to an acceptable level. 3. Establish critical limits for each critical control point. A critical limit is the maximum or minimum value to which a physical, biological, or chemical hazard must be controlled at a critical control point to prevent, eliminate, or reduce that hazard to an acceptable level. You may also see policy analysis examples. 4. Establish critical control point monitoring requirements. Monitoring activities are necessary to ensure that the process is under control at each critical control point. In the United States, the FSIS, or Food Safety and Inspection Service, requires that each monitoring procedure and its frequency be listed in the HACCP plan. 5. Establish corrective actions. These are actions to be taken when monitoring indicates a deviation from an established critical limit. The final rule requires a plant’s HACCP plan to identify the corrective actions to be taken if a critical limit is not met. Corrective actions are intended to ensure that no product is injurious to health or otherwise adulterated as a result if the deviation enters commerce. You may also see market analysis demand and supply. 6. Establish procedures for ensuring the HACCP system is working as intended. Validation ensures that the plants do what they were designed to do; that is, they are successful in ensuring the production of a safe product. Plants will be required to validate their own HACCP plans. FSIS will not approve HACCP plans in advance but will review them for conformance with the final rule. Verification ensures that the HACCP plan is adequate, that is, working as intended. Verification procedures may include such activities as a review of HACCP plans, CCP records, critical limits, and microbial sampling and analysis. FSIS is requiring that the HACCP plan include verification tasks to be performed by plant personnel. You can also take a look at earned value analysis. 7. Establish record keeping procedures. The HACCP regulation requires that all plants maintain certain documents, including its hazard analysis and written HACCP plan, and records of documenting the monitoring of critical control points, critical limits, verification activities, and the handling of processing deviations. Implementation involves monitoring, verifying, and validating of the daily work that is compliant with regulatory requirements in all stages all the time. You can also check out competitive analysis. Prerequisite programs are programs that are put in place in the facility to control hazards in the environment, preventing contamination of the product. You may also see customer profitability analysis. 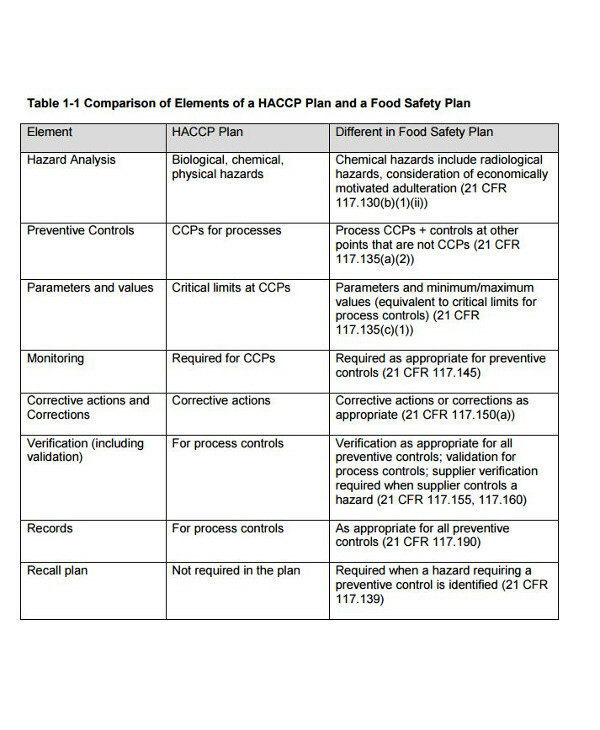 HACCP Plans are prepared for each process or product and identify possible hazards and controls in place to make sure the hazards are eliminated or controlled to ensure acceptable levels in the food product. 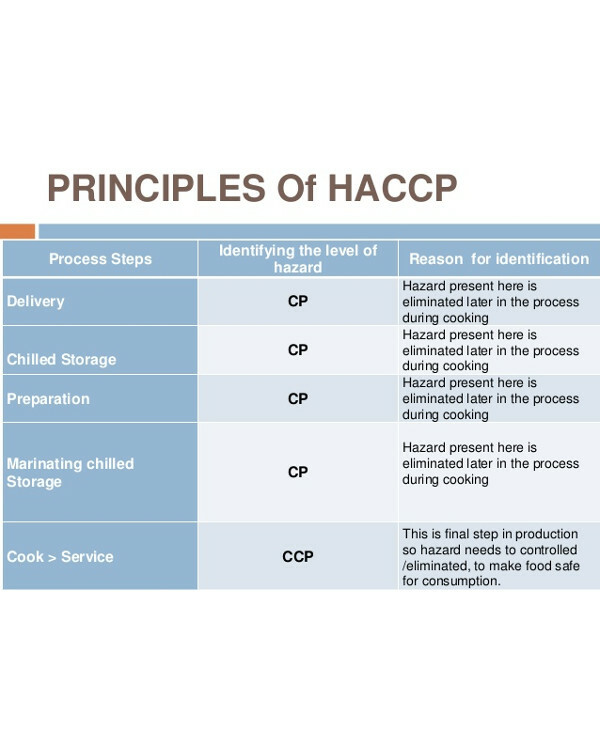 Let’s examine the steps in developing a solid HACCP plan. The first step is assembling a team of individuals who have specific knowledge and expertise about the product and process. The multidisciplinary team should include individuals from departments such as engineering, production, sanitation, quality assurance, food microbiology. You may also see feasibility analysis examples. Don’t forget to include local personnel who are involved in the operation. The team may benefit from outside experts to weigh in on potential biological, chemical, and physical hazards, but these experts should serve as consultants, not as a replacement for your HACCP team. First, the HACCP team provides a general description of the food, ingredients, and processing methods. Then the method of distribution should be described along with information on whether the food is to be distributed frozen, refrigerated, or at ambient temperature. You may also see customer analysis examples. 3. Identifying the Intended Use and Consumers. Describe the normal expected use of the food. The intended consumers may be the general public or a particular segment of the population, such as infants, immunocompromised individuals, or the elderly. 4. Construct Flow Diagram to Describe the Process. The flow diagram should provide a clear, simple outline of all the steps involved in the process that is directly under the control of the establishment. The flow diagram can also include steps in the food chain which come before and after the processing that occurs in the establishment. Also check out sales analysis. The HACCP team should perform an on-site review of the operation to verify the accuracy and completeness of the flow diagram, and modifications should be made to the diagram as needed. After these first five preliminary tasks have been completed, the following seven principles of HACCP are applied. You may also see investment analysis examples. 6. Conduct a Hazard Analysis (Principle 1). At this point, the HACCP team conducts a hazard analysis and identifies appropriate control measures. They should list all potential hazards associated with each step. 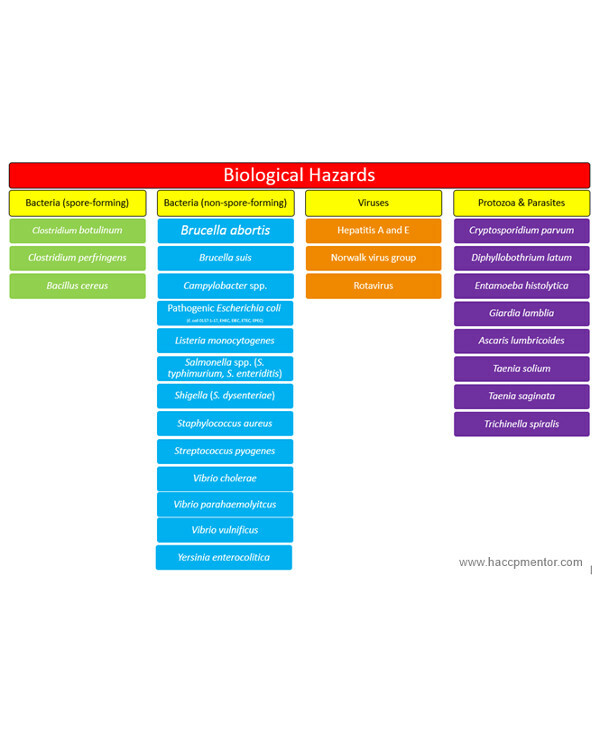 Note: A hazard is defined as a biological, chemical, or physical agent that is reasonably likely to cause illness or injury in the absence of its control, such as safety concerns or not quality concerns. You may also see job analysis examples. During this “brainstorming session” stage, the HACCP team reviews the ingredients used in the product, the activities conducted at each step and the equipment used, the final product and its method of storage and distribution, and the intended use and consumers. 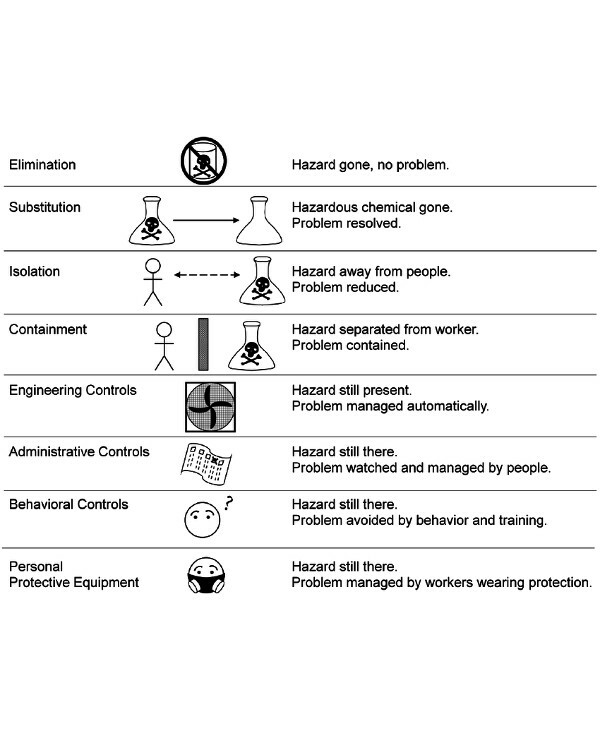 Based on this review, the team develops a list of potential biological, chemical, or physical hazards which may be introduced, increased, or controlled at each step in the production process. You may also see requirements analysis. During this stage, the HACCP team evaluates the severity and likelihood of each potential hazard occurring and decides which ones must be addressed in the HACCP plan. Such considerations do not include common dietary choices that lie outside of HACCP. 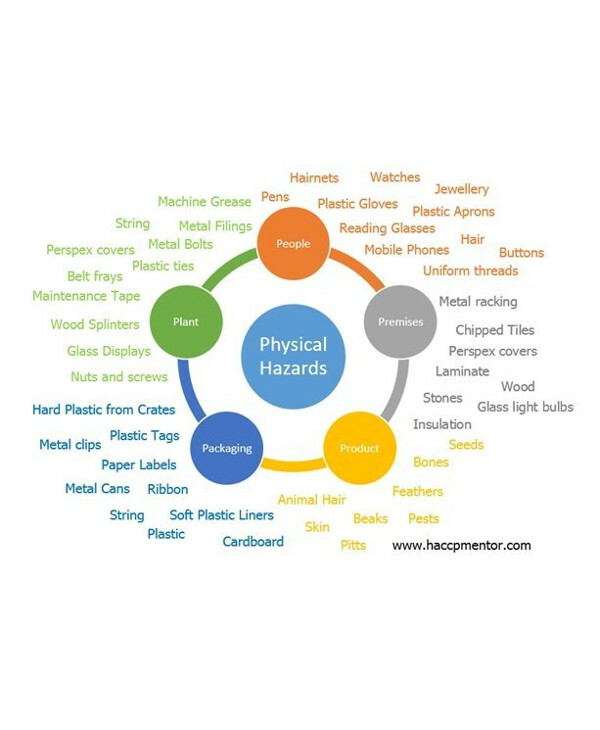 After completing the hazard analysis, the hazards associated with each step in the production of the food should be listed along with any measures that are used to control the hazards. The term “control measure” is used because not all hazards can be prevented, but virtually all can be controlled. Here are more free analysis examples. 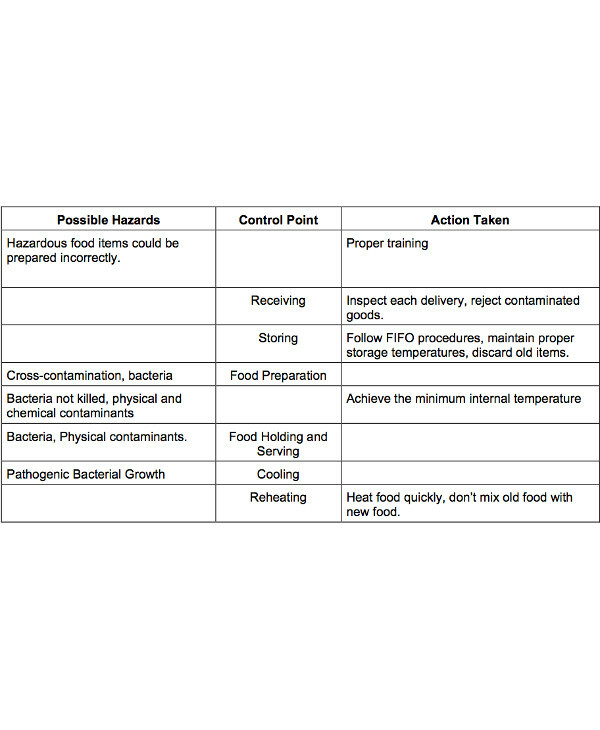 A critical control point is defined as a step at which control can be applied and is essential to prevent or eliminate a food safety hazard or reduce it to an acceptable level. The potential hazards that are reasonably likely to cause illness or injury in the absence of their control must be addressed in determining Critical Control Points. You may also see education gap analysis examples. One strategy to facilitate the identification of each CCP is the use of a CCP decision tree. However, you must keep in mind that a decision tree is merely a tool, and is not a mandatory element of HACCP, nor is it a substitute for expert knowledge. Take a look at business systems analysis. Examples of CCPs may include chilling, thermal processing, product formulation control, testing ingredients for chemical residues, and testing products for metal contaminants. CCPs must be carefully developed and documented. Additionally, they must be used only for purposes of product safety. Different facilities preparing similar food items can differ in the hazards identified and the steps which are CCPs. This can be due to differences in each facility’s layout, equipment, selection of ingredients, and processes employed. A critical limit is a maximum or maximum value to which a biological, chemical, or physical parameter must be controlled at a CCP to prevent, eliminate or reduce to an acceptable level the occurrence of a food safety hazard. A critical limit is used to distinguish between safe and unsafe operating conditions at a CCP. Critical limits should not be confused with operational limits which are established for reasons other than food safety. You may also see quantitative analysis examples. Each CCP will have one or more control measures to assure that the identified hazards are prevented, eliminated, or reduced to acceptable levels. Each control measure has one or more associated critical limits, which can be based upon factors like temperature, time, physical dimensions, humidity, moisture level, water activity, pH, titratable acidity, salt concentration, available chlorine, viscosity, preservatives, and sensory information such as aroma and visual appearance. You may also see business case analysis examples. It facilitates tracking of the operation. If monitoring indicates that there is a trend toward loss of control, then action can be taken to bring the process back into control before a deviation from a critical limit occurs. It is used to determine when there is a loss of control and a deviation occurs at a CCP. When it does, an appropriate corrective action must be taken. It provides written documentation for use in verification. Ideally, monitoring should be continuous, which is possible with many types of physical and chemical methods. Continuous monitoring is always preferred when feasible, but monitoring equipment must be carefully calibrated for accuracy. You may also see Job task analysis examples. No system is perfect, so when preventive measures fail, corrective actions must be in place to prevent potentially hazardous foods from reaching consumers. Corrective actions should determine and correct the cause of non-compliance and the disposition of non-compliant products, and record the corrective actions that have been taken. You may also see activity analysis examples. Specific corrective actions should be developed in advance for each CCP and included in the HACCP plan. As a minimum, the HACCP plan should specify what is done when a deviation occurs, who is responsible for implementing the corrective actions, and that a record will be developed and maintained of the actions taken. You may also see bowtie risk analysis examples. Since eating make up a big part of every person’s day, and food is our main source of nourishment, ensuring that every bite is safe for human consumption is crucial for our health. Thankfully, there’s a HACCP to help ensure that. You may also see job safety analysis examples.